As a youngster growing up during the Great Depression in the Tennessee hills, once in awhile we could count on having a mess of catfish and hush puppies for dinner. My mother fried them with her wood-burning kitchen stove in iron skillets. The deep-fried food can now be found at “Fast Food Restaurants.” But either way, fried food is delicious. The medical people tell us that fried food is not good for us. I say it taste good and I am 85 years old. None of us can expect to live forever. I also say; “enjoy what you like while living on Earth. We never know which way we will go after death.” We also caught trout, pike and perch from Saw Creek which was adjacent to our farm. My mama used the same frying method as she did with catfish. Melt enough shortening in a large skillet or Dutch oven over medium heat to reach 3/4 inch. Meanwhile, pour the cornmeal onto a platter or shallow dish. 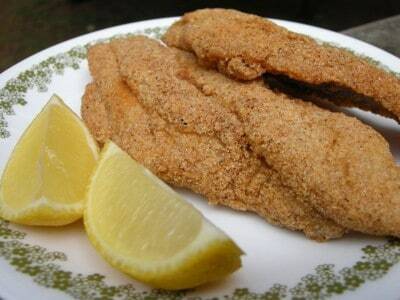 Season both sides of the fillets with salt and pepper, and then dredge in the cornmeal, shaking off any excess. Gently slide the fillets into the skillet when the fat is hot but not smoking, being careful not to crowd the skillet. Fry, in batches until crisp and golden brown, about 4 minutes. Turn the fillets over and fry 4 minutes more. Transfer the fillets to clean paper bags or a paper towel-lined platter with a slotted spoon. Serve with the lemon wedges. Hush Puppies are to fried fish what butter is to a biscuit. You just can’t have one without the other. The story goes that “Hush. Puppies” is what camp cooks shouted to the yelping hound dogs when they tossed them the fried scraps from their skillets. Whatever their origin, they are easy as pie to make – just whip up the batter and drop it by the spoonful into piping-hot fat. I like to fry them in the same fat that was used frying the fish. In the old day, we used Lard which was a byproduct from butchering our hogs. Combine the cornmeal, flour, and sugar in a medium bowl. Add the egg and onion and stir until combined. Gradually stir in the buttermilk, adding enough to make a thick batter that will easily drop from a spoon. Meanwhile, heat enough oil in a deep skillet or Dutch oven to reach 2-1/2 to 3 inches. When the fat is hot enough (about 375) degrees on a deep fry thermometer), drop in the batter by the teaspoonful. Fry, turning occasionally, until the Hush Puppies are golden brown. Transfer with a slotted spoon to a paper towel-lined plate. Serve warm. This entry was posted in Country Cookin', Entrees, Fish. Bookmark the permalink.